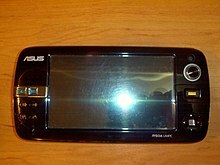 Second-generation UMPCs used less electricity and therefore could be used for longer (up to five hours) and also had support for Windows Vista. Originally code-named Project Origami, the project was launched in 2006 as a collaboration between Microsoft, Intel, Samsung, and a few others. After largely being supplanted by tablet computers, production of ultra-mobile PCs were discontinued in the early 2010s. Ockel Computers has been developing the Ockel Sirius B, a complete desktop PC that fits into your pocket early 2015. On popular demand Ockel further developed the Ockel Sirius B and introduced the successor – the Ockel Sirius B Black Cherry in November 2016. Late 2016 the global market introduction of the Ockel Sirius B Black Cherry took place. Ockel has also been working on the UMPC, including a 6’’ touchscreen. The Ockel Sirius A – the most versatile UMPC ever created - was launched mid-2016 as a crowdfunding campaign on Indiegogo. The crowdfunding campaign raised 1 million dollars and in 2017 the company started shipping the device to backers across 88 countries globally. GPD has been developing the GPD Win, an x64 Windows 10-powered handheld gaming PC, since October 2015 and was launched and first distributed globally in October 2016. GPD has also released the GPD Pocket, a 7-inch PC which includes an aluminum casing and a full keyboard. It was released in mid-2017 after receiving more than $3 million in crowdfunding. ^ Spelled lower case because it's a type of computer, not a specific product, see Microsoft's description. ^ "Microsoft Unveils Project Origami". Yahoo! News. 9 March 2006. ^ "TabletKiosk Now Shipping Sahara Slate PC i440D with Windows Vista" (Press release). TabletKiosk. March 20, 2007. ^ "Microsoft Preps Ultramobile PC for Second Chance". eWeek Channel Insider. June 19, 2006. ^ "New Samsung Q1 Ultra models ditch Vista for XP". Pocketables. August 28, 2007. Barry J. Doyle, TabletPCReview staff (1 December 2006). "TabletKiosk eo v7110 UMPC Review". TabletPC Review. TechTarget. Retrieved 2013-08-10. Hot on Samsung's heels though was TabletKiosk busting a snappy roll out of the eo v7110 UMPC. 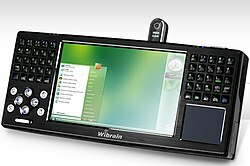 Wikimedia Commons has media related to Ultra-Mobile PCs.